Interested in learning more about Horse Temperament Typing? Then we have a class for you! This online course has been created to share information with you about the eleven Horse Temperament Types as explained by Madalyn Ward, DVM. Dr. Ward has been a pioneering voice in the field of holistic horse care for over two decades and she breaks new ground with the Horse Temperament Typing system. Her cutting edge casework now extends to helping horse lovers find their perfect equine match or better understand their current equine partner. This Typing class has been approved for CE credit by NBCAAM. 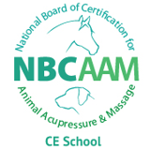 So any NBCAAM certified massage or acupressure practitioners that need CE credit can take the online course and then if they submit 3 case studies to us after completion of the course, they will be given 15 hours.